The federal Bureau of Labor Statistics reports that the fastest-growing segment of the workforce is people 75 and older. Shirley Martin is one of them. When we met her five years ago, she was a greeter at Walmart, making slightly more than minimum wage. 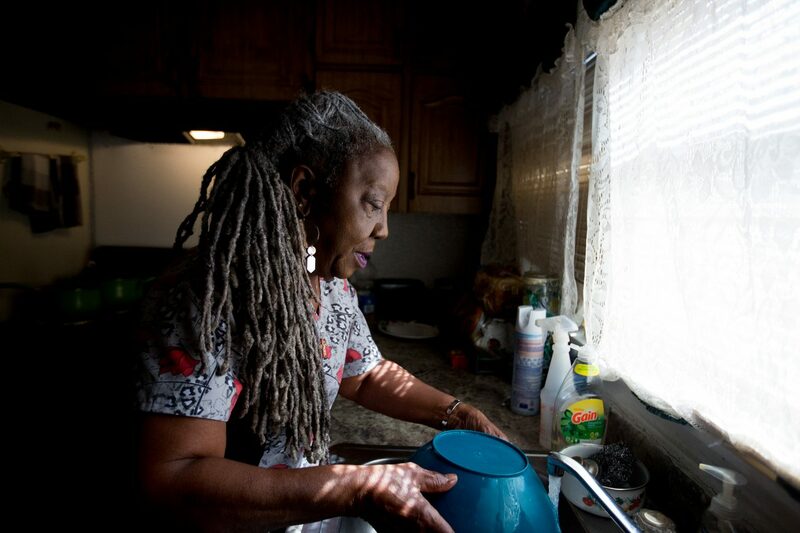 Today, she’s 77 and manages a group home for adults with disabilities in South Dallas. She’s better off financially, but to stay that way, she works full time — and she has no plans to stop. Wherever Shirley Martin goes, she sizzles. Or maybe it’s the magic she makes in the kitchen. The chicken fajitas she’s cooking smell so good, both residents of the group home where she works have gathered in the next room to wait for the dinner bell. Shirley cooks them three meals a day, plus snacks. 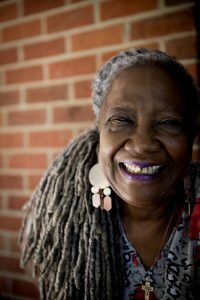 For 34 years, Martin was a cook at Hockaday, a private all-girls school in Dallas. She also catered events and parties. While food is still her great love, she says the job she has now suits her better. She’s a caregiver for two clients. Sometimes she works every day of the week, spending nights at their homes, too. Sometimes she heads back to her Dallas apartment for the weekend. But she’s not complaining. Shirley keeps the job because she likes it — but also because she needs it. She doesn’t have a pension or much in savings. And $1,100 a month from Social Security won’t pay the bills. The group home caregiver job brings in another $1,300 or so a month. She can pay rent, keep the lights on, fill up her car with gas and still have enough left for a night out, or a manicure. “I’m in a better spot now. And I’ve learned how to really save and just use what I have to use,” Martin said. “But I still believe in living and looking good and doing what I have to do for me. 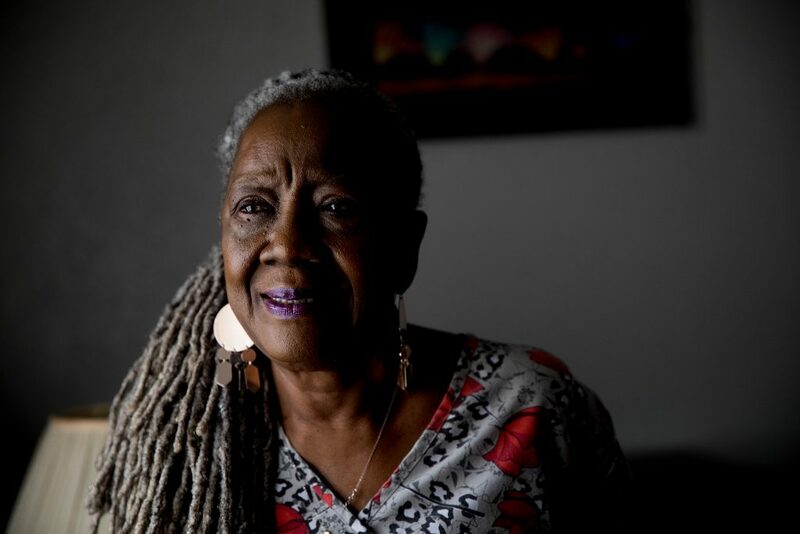 Shirley Martin is in the same boat as a lot of Texans, who are the right age for retirement but can’t survive on a just Social Security check. The Bureau of Labor Statistics says the category of workers 75 and older will grow by 6.5 percent by 2024 — faster than any other age group. Frances Deviney with the Austin-based Center for Public Policy Priorities says some fundamental things in the economy have changed. Working people can usually put a little money aside over time. But it’s going to take employers with savings incentive programs to pave the way to a comfy retirement, Deviney says. Martin isn’t looking to retire. She can’t afford to — and she doesn’t want to. “I’m hoping to go until I’m 90,” she said. And once you spend a little time with her, it’s easy to believe that she will. The care she takes when she cooks for her residents, the easy way she talks to them, the tidy house she keeps — this job fits her. And she says she doesn’t spend time fretting over an illness that might derail her down the road, or an unexpected expense that might crop up. And, Martin says, she’d rather live on faith than fear.